Thermal monoculars like the Pulsar Helion line are invaluable for walking in and out of hunting setups, stalking prey, blood tracking and game recovery. Things have heated up in thermal world over the past decade. Even five years ago, regular Joes had to sell their first born for a low-grade device. In 2015, I even wrote an article about affordable thermal and night vision devices, with the lowest grade thermal monoculars coming in around the $3,500 - $4,000 range. By technology and pricing standards today, those units would sell for $2,000, maybe less while top shelf devices like Pulsar Helion thermal monoculars are in that range with exponentially more features and superior imaging — a couple models, like the popular Pulsar Helion XP50 and XP38 models, are slightly more expensive but offer jaw-dropping performance. Of course, lately, the trend has gravitated toward riflescopes but monoculars definitely should not be discounted. If anything, handheld thermal devices like the Pulsar Helion are most assuredly used for more applications than riflescopes. Thermal monoculars offer a wealth of latitude and even more peace of mind, depending on the environment and application. Rifle hunting is a great example. You can bet other hunters appreciate thermal scouting with a monocular exponentially more than somebody lifting their rifle and scanning through a mounted device. If anything, a riflescope could be removed for glassing then reinstalled — the Pulsar Trail is designed to effectively maintain zero given a return to its original location. Still, the additional effort to remove and reinstall an optic mid-hunt is less than ideal — a stronger case for an optic like the Pulsar Helion. In addition to scanning, thermal monoculars are invaluable for walking in and out of hunting setups, stalking up on prey undetected, blood tracking and game recovery. Bowhunters also benefit from thermal used in these hunting applications. I recovered a hog I shot from a treestand in less than 15 seconds; I simply stood in my treestand and scanned the area. The feral hog glowed on my display less than 30 yards away. Normally, I would have had to blood-track her. Of course, for the memories, I can also use the Helion’s onboard still camera and video capabilities, as well as Wi-Fi to share my display with a connected device, stream content and transfer data, use my phone as a remote control and even download firmware upgrades. Not long ago, McLennan County Sheriff Department Patrol Deputy, Joseph Ballew, used a Pulsar Helion XP50 thermal monocular to locate two suspects who fled a fatality vehicle accident. Using his monocular from a helicopter roughly 800 yards overhead, he led officers on the ground to their location. They were apprehended and Ballew captured the activity with the Helion’s onboard video camera for evidence. A police officer in Mississippi used his Helion thermal monocular to catch a peeping Tom. The value of a thermal monocular for law enforcement duties cannot be emphasized enough; in fact, many officers whose departments unable or unwilling to purchase thermal technology, purchase devices on their own. This has also led to the development of Pulsar’s law enforcement division, where individual officers and agencies alike are offered VIP pricing. Not necessarily to be confused with an ability to ward off a physical attack, thermal monoculars are invaluable for homeowners to identify heat signatures under cloak darkness in the event of breech or trespass, in short, home invasion, burglary, etc. Landowners in near border areas also use thermal to identify illegal immigrants crossing through their properties—areas most certainly exposed to potentially dangerous individuals. Landowners prefer to know strangers are approaching well in advance. The trouble is, thermal creates more work for me. I use my Pulsar Helion for hunting more than anything. My wife found out she could use it to identify electrical hot spots in the walls of home, voids in wall insulation, heat and cold infiltration around windows and doors and even to locate studs in the walls. Honestly, I can even identify nails in the framing. All of these homeowner uses have led to a laundry list of honey dos—definitely not my intended purpose for thermal but hey, somethings are a compromise. Thermal monoculars, like Pulsar’s Helion models, offer much more than I’ve detailed here. Thermal monoculars are great tools for border patrol agents to identify illegal immigration; boaters to identify overboard passengers, obstacles and vessels on waterways without running lights; firefighters to identify hot spots and first responders for search and rescue missions. Honestly the, list of thermal monocular applications is seemingly unending. In a nutshell, Helion is Pulsar’s premium thermal monocular line and consists of XP models boasting 640x480 microbolometer resolution, as well as XQ models with 384x288 microbolometer resolution. XP models include the XP28, XP38 and the flagship XP50. XQ models include the XQ30, XQ38 and XQ50. Pulsar Helion XP50 and XQ50 deliver heat signature detection of adult-size targets up to 2,000 yards away. 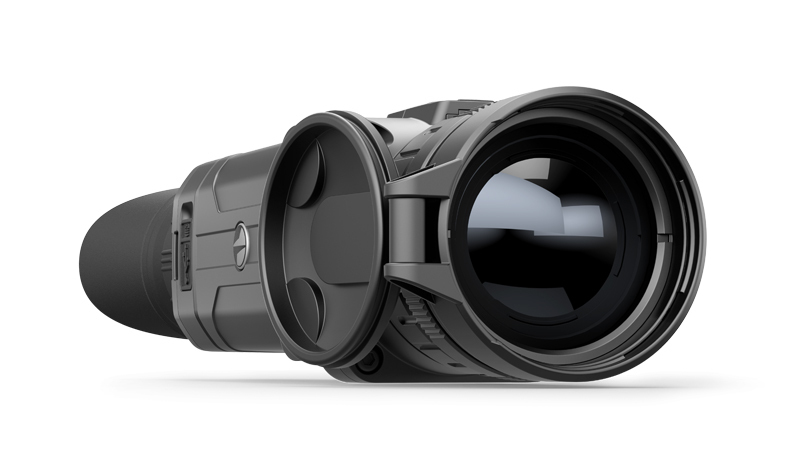 All Helion models include a 50Hz frame rate, 640x480 AMOLED display, onboard still and video camera with audio, Wi-Fi connectivity, variable magnification, an 8-color display palette, adjustable display and distance focus, picture-in-picture, a stadiametric rangefinder, 8-hour rechargeable battery, brightness and contrast controls, imaging and calibration modes and other beneficial menu controls; in fact, for their price points, Pulsar Helion thermal monoculars are absolutely the best thermal option the industry has to offer. To learn more about Pulsar Helion thermal monoculars, visit www.Pulsarnv.com.